Wow, good numbers. Now you definitely just need to get those a/f ratios down to 11.5-12. Sounds like you guys are going in the right direction with the fuel system. Good work so far! It would be nice though to post your mods in the first post with the dyno run or dyno sheet to let everyone know what your mods were at the time of the run so it's not scattered all over the thread. No problem at all, it was just a suggestion so he or you don't get bombarded with questions about his mods later on. -Maxima electric rad fans relayed and switched on with a MK1.5/MK2 AC fan thermoswitch. -"Earl's" braided SS front brake line for 280zx used for clutch line into slave cylinder/clutch dampener delete. what kind of ebay clutch did you get? They're all the same. Go with the one with the best feedback. The flywheel is for the Ka I presume? You know, 13:1 AF is ideal for power... However since you're running with out an intercooler, you'll want it in the range of 11:1 - 10.5:1. BUT, since you're planning on using alcohol injection, you could keep the 13:1 AFR and use a 60/40 meth/water mix spray as you come into around 5PSI and make more power. The problem with this however, you have no way to fine tune your timing. SAFC will not cut it here, you'll need ECU programming for that. Actually, with 60+ alcohol at 0-5PSI, you can actually run much more timing at 13:1 AFR. But if you want it be decently reliable, I would shoot for 12:1 - 11.5:1 AF, inject a minimum of 50/50 mix at 5PSI. Unless you slap an intercooler on it, and run 93 octane (which you should be running anyway ). I have 10.8:1 at WOT and a 50/50 mix @ 5PSI, and my timing map is actually still way too conservative when it starts coming into boost. I could still pull out a lot more torque on boost, even though I'm running 10:1 compression NA pistons. BTW, a small intercooler (25" wide, 8" tall, 3" deep) isn't going to add any significant lag or pressure drop, I'd venture a guess that you couldn't tell the difference. It would give a lot more leeway in tuning and more more power, especially if you're going to be running at poor T25G at 14PSI (basically being a hot air gun at that point). First off to all the people who keep arguing me about the intercooler thing. I am not saying that intercoolers don't work or that they're pointless or that you're dumb for using one. I am saying that people need to recognized that there are trade-offs that go with the benifit of lower intake air temps. 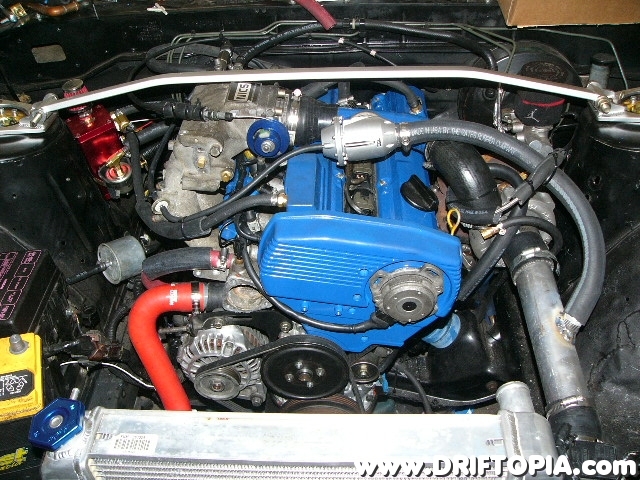 My build is geared toward mid to top end power and throttle response in drifting/screwing around applications. Throttle response and especially the response between shifts or when working the throttle mid drift. Think of it this way. You're WOT and you let off the throttle. The BOV lets off and evacuates the majority of the air mass contained within the whole of the charged air path. Then you get back on the throttle and the turbo has to repressurize all that volume before any pressurized air even makes its way into the engine. Boost response.. its all about boost response. Oh and as for pressure drop I'll leave this one to the pros..
"Another aspect of intercoolers to be considered is pressure drop. The pressure read by a boost gauge is the pressure in the intake manifold. It is not the same as the pressure that the turbocharger itself puts out. To get a fluid, such as air, to flow there must be a difference in pressure from one end to the other. Consider a straw that is sitting on the table. It doesn't having anything moving through it until you pick it up, stick it in your mouth, and change the pressure at one end (either by blowing or sucking). In the same way the turbo outlet pressure is higher than the intake manifold pressure, and will always be higher than the intake pressure, because there must be a pressure difference for the air to move. The difference in pressure required for a given amount of air to move from turbo to intake manifold is an indication of the hydraulic restriction of the intercooler, the up pipe, and the throttle body. Let's say you are trying to move 255 gram/sec of air through a stock intercooler, up pipe, and throttle body and there is a 4 psi difference that is pushing it along (I'm just making up numbers here). If your boost gauge reads 15 psi, that means the turbo is actually putting up 19 psi. Now you buy a PT-70 and slap on some Champion heads. Now you are moving 450 gm/sec of air. At 15 psi boost in the intake manifold the turbo now has to put up 23 psi, because the pressure drop required to get the higher air flow is now 8 psi instead of the 4 that we had before. More flow with the same equipment means higher pressure drop. So we put on a new front mount intercooler. It has a lower pressure drop, pressure drop is now 4 psi, so the turbo is putting up 19 psi again. Now we add the 65 mm throttle body and the pressure drop is now 3 psi. Then we add the 2.5 inch up pipe, and it drops to 2.5 psi. Now to make 15 psi boost the turbo only has to put up 17.5 psi. The difference in turbo outlet temperature between 23 psi and 17.5 psi is about 40 deg (assuming a constant efficiency)! So you can see how just by reducing the pressure drop we can lower the temperatures while still running the same amount of boost. Pressure drop is important because the higher the turbo discharge pressure is the higher the temperature of the turbo air. When we drop the turbo discharge pressure we also drop the temperature of the air coming out of the turbo. When we do that we also drop the intercooler outlet temperature, although not as much, but hey, every little bit helps. This lower pressure drop is part of the benefit offered by new, bigger front mount intercoolers, by bigger up pipes; and by bigger throttle bodies. 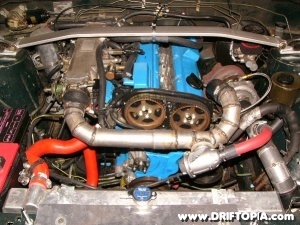 You can also make the turbo work less hard by improving the inlet side to it. 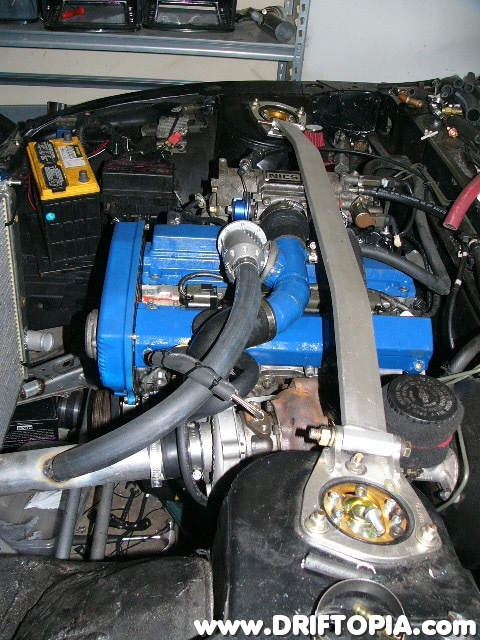 K&N air filters, free flowing MAF pipes, removing the MAF itself when switching to an aftermarket fuel injection system, these all reduce the pressure drop in the turbo inlet system which makes the compressor work less to produce the same boost which will reduce the turbo discharge temperature (among other, and probably greater, benefits)." Heres a setup he ran thats similar to my current setup. Now hes using the side facing intake mani from the FWD CA16/18DE. I don't have a problem with you running non-intercooled, I was just sayin, especially since you're planning on using water+alcohol. Another point for using an intercooler, would be to reduce the dependency on the water/alcohol mix... Running out of the mix while WOT would be bad if you heavily depended on. That's the main reason I have an intercooler, otherwise I would be running boost pipe like yours and have some insane timing, also I would be using 100% meth.